The Bobcats continued their winning ways on Wednesday with a come from behind 3-1 victory over Columbia. Sophomore Jess Rusin sparked the Bobcats with the game-tying goal and winning goals after falling behind 1-0 after just 2:44 in the first half. 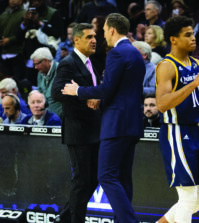 Quinnipiac (6-2) has won three straight games and has already tied the program’s Division I record for non-conference wins in a season (six) with three games still left to play. Playing without starting sophomore forward Amanda Danziger due to injury, Rusin filled the void and scored her sixth and seventh goals of the season, good for a tie for first on the team with Kim Cunniff. At the 2:44 mark of the first half, the Lions jumped out to an early lead as Paige Simmons fired a shot past Quinnipiac goalkeeper Nicole Lewis just a few feet in front of the goal for a 1-0 advantage. Columbia fired four shots in the first six minutes and dominated possession up through the 13 minute mark. 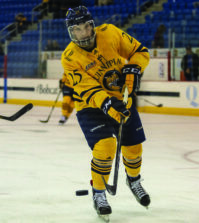 The Quinnipiac offense came alive after Simmons fired a shot, saved by Lewis, and taken up field by the Bobcats. The transition play resulted in a penalty corner where senior Megan McCreedy fired a shot that was saved initially, but deflected over to Rusin who tapped in the goal to tie the score, 1-1. Lewis continued to dominate between the pipes as she denied three shots on goal in a span of five minutes for the Lions after the Rusin score. The senior goalkeeper finished with 14 saves against 15 shots on goal, her most since the Bobcat’s 3-2 win over Yale on September 4. Rusin netted the game winner at the 53:50 mark, as she combined with senior Kaitlyn Notarianni on the goal. Notarianni tallied her fifth assist on the season, which eclipsed her previous career-high of four in a season. The senior forward also tacked on an insurance goal at the 64:46 mark when she blasted a shot past the diving Lion goalkeeper. 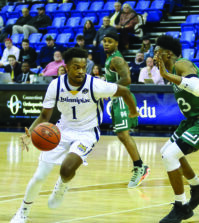 Something will have to give as the Bobcats will take their undefeated home record (5-0) and three game winning streak into their matchup against Maine on Sunday. As of September 21, the Blackbears (8-1) are No. 14 in country and have outscored their opponents 45-10 in their current eight game winning streak.